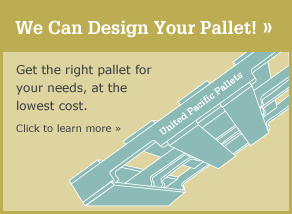 United Pacific Forest Products understands the pallet manufacturing and shipping industry inside and out. We are recognized for our ability to provide consistent quality, competitive pricing, and exceptional customer service. Based in Portland, Oregon, United Pacific Forest Products offers a complete range of wood pallets for your supply chain needs. Pallets touch every link in the supply chain. Therefore, we provide value-added services to assist you in streamlining and reducing the costs of your entire pallet and shipping program. We will analyze your specific applications and set up a comprehensive solution to improve your operational and shipping efficiency – improving your bottom line. Serving many of the nation's largest firms, we have the expertise to determine the right pallet for your company.